In the mid-2000s, an observer might have thought professional freeskier Angeli VanLaanen was headed for the Olympics. But even though she was a phenomenal skier, in the background, she was struggling with a strange variety of physical symptoms that threatened her ability to keep going. By 2009, she was seriously impaired and not one of her doctors could figure out what was wrong. 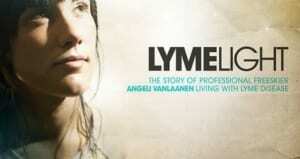 Finally, her aunt Jenny suggested she get tested for Lyme disease. The results were positive. Under the treatment of a Lyme-literate doctor, she underwent an arduous struggle to regain her health and return to skiing. She also decided to make a film about her experience. You have no idea how much you film touched my heart ! I’m a 51 year old man who’s worked outside my entire life, I was infected in midwest Wisconsin in 2000. I gave up hunting, camping, fishing, mountain biking, kayaking, archery, and just having the ability to have a normal life. Your story hit me so hard because I have a 24 year old daughter who also has Lyme. Like you, she is moving on with a healthy lifestyle, and I hope by being young you guys natural immune systems can take over and heal you. I haven’t been able to do all my old hobbies but I am functional due to some wonderful LLMD’s. I am very active in Lyme support, and you know I will be sharing your video with everyone I know, including Doctors and media people. I hope you were able to participate in the World Wide Lyme protest. Yes, you’re a great skier, but in my mind you’re greatest accomplishment is this helpful documentary.